Traditional and digital books were the subjects of the last post – along with my hope that each would thrive because they give readers and writers choices. But as I thought about the current book and publishing markets, I had to acknowledge one area of collateral damage: the bookstore, both mega and independent – that combination library and retail store, all in one. Anyone born before the internet hit big time in the 1990’s was used to traditional books and independent bookstores. As a kid in Buffalo, I went with my dad to Ullrich’s Stationery and Books. While he bought business supplies, I dug through the bargain book bin. There I discovered Edgar Allan Poe, John Steinbeck, and William Faulkner. I caught the bookstore habit early on. But over time bookstores changed. Mega-bookstores debuted on the scene. Crown Books came and went. Borders and Barnes & Noble arrived. With the changing market, Border’s became a casualty; however, Barnes and Noble kept competitive by adding The Nook e-reader and over one million Nook Books. While large chain bookstores may have their place, they just don’t give that intimate bookstore experience. I wanted the independent bookstore, its personality, pzazz, uniqueness, whether it sold new or used or both. I went looking. One independent I found was The Book Rack in La Quinta, CA. The store has been at the same location for 15 years. And, yes, that’s Fabio, the store’s mascot, standing by the door, ready to usher you in. You can browse through the used paperbacks as well as some near new or brand new books … over 46,000 titles, plus audio-books on CDs and tapes. The store is well-organized, clean, and a friendly, knowledgeable staff is always on duty. 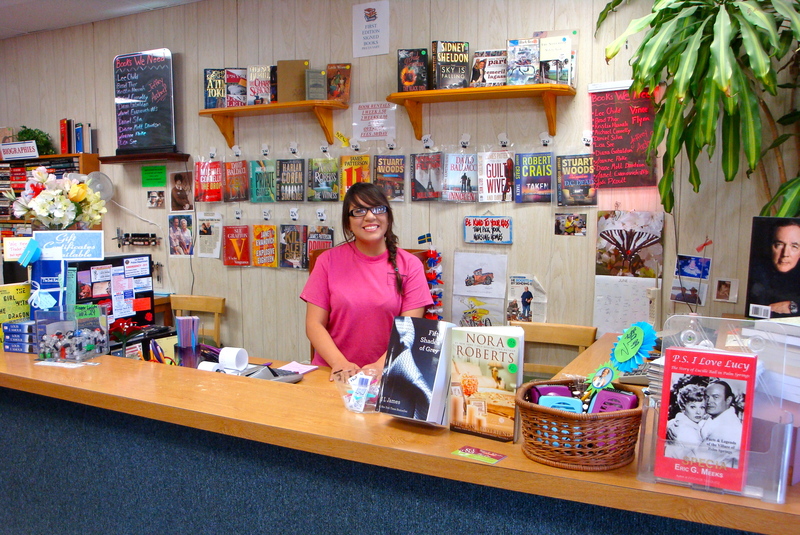 When you enter, a staff member will greet you with a happy “Hello” and guide you to the book you want or to an area of interest. Categories include trade-size literary books, mass market best sellers, thrillers, mystery/suspense, romance, paranormal/time travel, historical fiction, historical romance, western, the classics, war fiction, true crime, science fiction, biography, Christian, children’s, and non-fiction. Something for everyone. Paperback books are sold for 1/2 the cover price plus tax. And you’ll want to inquire about the book-trading policy. Printed on the bookmark given with purchase is this statement: “These books were owned by a little old lady who never read faster than 50 words per minute.” Perfect for a store specializing in used paperbacks in good condition. In addition, you can rent hardback new releases for $3.50 per week plus tax or $4.50 for two weeks plus tax. Or you can buy a gently used hardback title that has been read once and not out in paperback yet for $10.00. An outside bookcart contains cookbooks priced as marked and fiction hardbacks for $3.oo. The owner, whose name is Holly, told me she enjoys hosting book signings for local authors. As a writer, I was happy to hear that. The store also hosts a book club which meets on the first Tuesday of the month. The club is dark now until October. I asked Holly what she liked about owning a bookstore. She smiled and said, “I love to meet people and I always have lots to read.” I also inquired about the challenges. Her reply: the summer months and staying competitive with today’s market and technology. Summing up … if you need a good read, books for a trip, or are looking for your current book club selection, you may want to try The Book Rack. And if you’re a local author, you might want to inquire about the possibility of a signing. 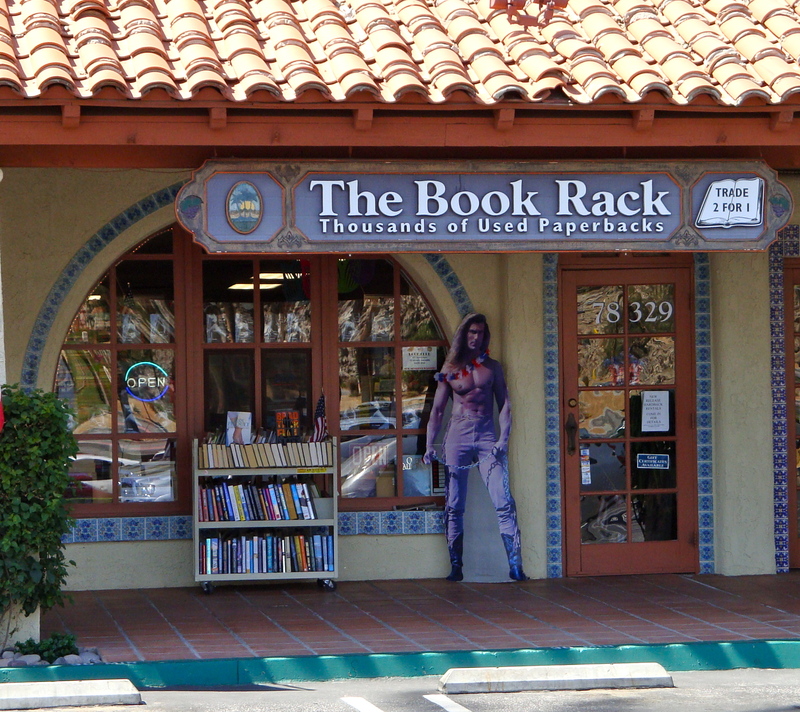 The Book Rack is located at 78-329 Highway 111 in the Von’s Center at Washington and Highway 111 in La Quinta. Telephone: 760-771-3449. Store hours are Monday – Friday 9:30 a.m. to 6 p.m., Saturdays 9:30 a.m. to 4:00 p.m., and Sundays 11 a.m. to 4 p.m.
Have any thoughts about your recent bookstore experience? 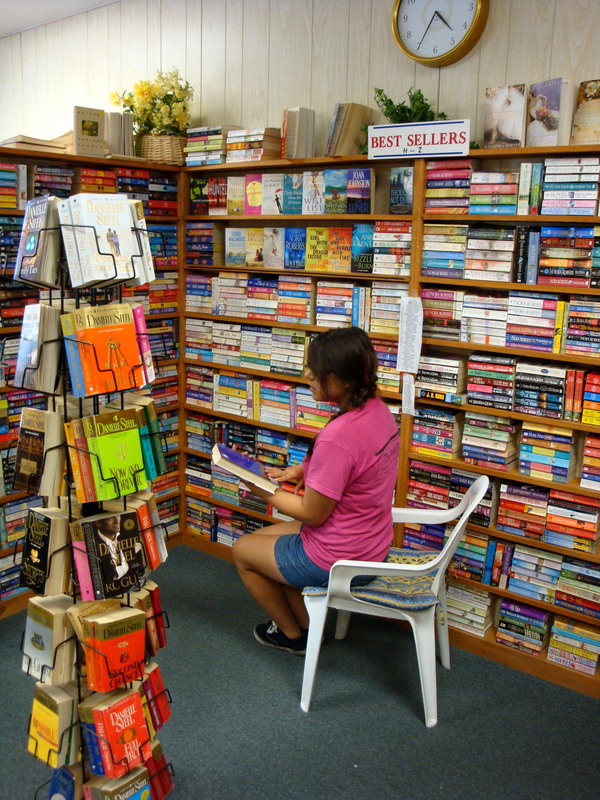 Have you been to an independent bookstore lately? Join the comment conversation. This entry was posted in Books, Reading, Where is the Book Store? and tagged paperbacks, The Book Rack. Bookmark the permalink. 8 Responses to Where is the bookstore? Hi Kerry – Yes, a good place to remember. Your story and pictures not only brought back fond memories of spending time in independent book stores, but I learned there’s one I didn’t know about in La Quinta. I’m heading there in the fall. Love your writing. 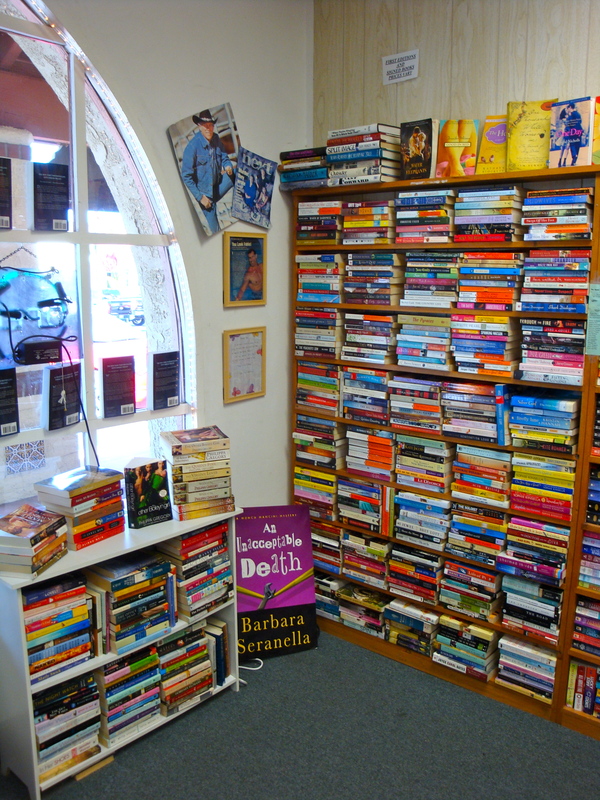 Hi Dolores – Indie book stores do seem to have that special lure of the unexpected. Thank you and glad you stopped by! Hi Susan – Being within the walls of a small indie book store, away from the large commercial endeavors, always leads me to unexpected reading and ideas. Glad you love ’em, too. Hi Sophia – I like your word “cozy” to describe indie bookstores. They always seems to have interesting nooks and crannies. Thank you for stopping by.